Editor's note, Nov. 30: Since this story was originally published, we've done additional reporting. We spoke with 11 current and recent Ballou teachers and four recent Ballou graduates, and we reviewed hundreds of attendance documents, class rosters and emails. They show that many students graduated despite chronic absenteeism. Records show half the graduates missed more than three months of school, or 60 days. Please find our updated story here. When Trayvon McKoy moved to Washington, D.C., from Maryland about two years ago, he'd never played drums before in his life. Then, when he enrolled at Ballou High School, he says he didn't have much choice. "I didn't even want to be in the band. My parents forced me." They also played in the band at Ballou when they were students here. "And it's probably one of the best things that's probably ever happened to me," he says. Now music is so much a part of his life that this fall he's headed to Bethune-Cookman University in Florida to major in music production. Maybe Trayvon's story doesn't seem unique, but he and the rest of the class of 2017 at Ballou will go down in history. They are the first class to be accepted, entirely, to college. "Everyone walks around with their heads high now," Trayvon says. 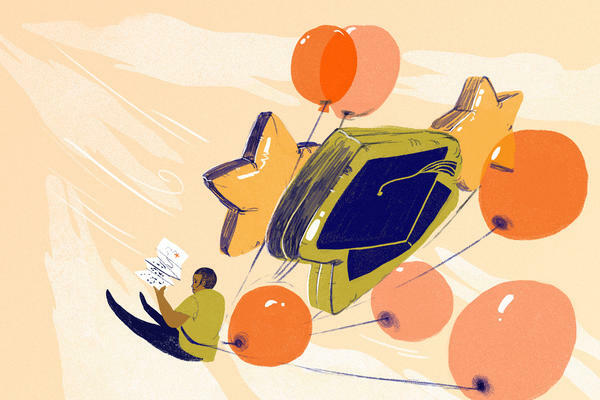 "Often, black students in an urban environment are not told that college could be the next step," says Yetunde Reeves, the school's principal. While every one of the 190 seniors was accepted to college, that doesn't include the students who have dropped out in the four years along the way. "Like we've been dreaming about it all four of our high school years. So receiving those acceptance letters made everything seem so real," says Trayvon. "All the seniors in Ballou are just planning to step up, make a difference, change the climate and the culture of Ballou and just mature as people." But it was a strong support system within D.C. Public Schools that made it a reality. For months and months, staff tracked students' success, often working side-by-side with them in the school library on college applications, often encouraging them to apply to schools where data show D.C. students perform well. And then there was money. Grants, donations and district funds took students on college tours around the country. The school kept spirits and motivation up with pep rallies, T-shirts and free food. When college acceptance letters started rolling in, Trayvon says it was a wake-up call for a lot of his friends. But it wasn't a year without struggle. More than a quarter of the teaching staff quit before the end of the school year — that's not usually a good sign. And out of the nearly 200 graduates, 26, are still working toward their high school graduation — hoping to earn their diploma in August. Principal Reeves recognizes these realities. And there are still more hurdles to overcome beyond college acceptance. The numbers show many D.C. grads don't finish college in six years. On graduation day, Trayvon is focused: "I'm just ready to walk across that stage and turn this tassel." With that, he heads up onto the graduation stage to get his diploma, knowing exactly where he's headed next.